By Terry Dunn on July 8, 2015 at 9 a.m. When it comes to airplanes, I have a soft spot for the rare and unusual. If an airplane looks like it shouldn't even be capable of flight…all the better. NASA's Super Guppy cargo plane meets all of those qualifications. When it comes to airplanes, I have a soft spot for the rare and unusual. If an airplane looks like it shouldn't even be capable of flight…all the better. NASA's Super Guppy cargo plane meets all of those qualifications. I've seen it fly many times, and I was even able to explore its interior once. Yet, it never fails to leave me scratching my head in slack jawed bewilderment. It is a tremendously unique aircraft with an equally unique history. The Super Guppy did not emerge from a clean drawing board. It is actually a mishmash of parts from several airplanes, along with a few custom pieces holding it all together. Some of those parts are from WWII-vintage designs. Despite its "Frankenplane" structure and relative age, the Super Guppy continues to do things that no other airplane in NASA's fleet can do. Indeed, few aircraft anywhere in the world can match this bulbous machine's ability to haul oversized cargo. 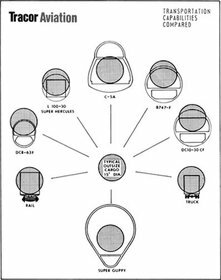 Before dissecting the makeup of NASA's current Super Guppy, it is worth reviewing the genealogy of aircraft that spawned it. As the story goes, aircraft salesman Lee Mansdorf and his friend, Jack Conroy conceived the "Guppy" idea in 1960 as an opportunity to provide logistical support to America's fledgling space program – even though NASA wasn't looking for help. 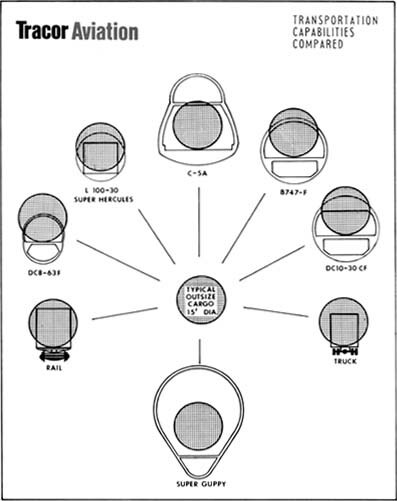 The manufacturers building spacecraft components were located all over the US. The only reasonable means to get these parts from one coast to the other was via ship travelling through the Panama Canal – an expensive and risky journey that could take weeks. Mansdorf and Conroy felt that air transport would be a much better method. Although there were airplanes capable of lifting the necessary weight, none were large enough to accommodate the girth of these loads. The industrious pair felt that they had a solution. Mansdorf owned several newly-retired Boeing Model 377 Stratocruiser airliners. This 4-engined beast of burden (and its military doppelgangers, the C-97 Stratofreighter and KC-97 Stratotanker) were derivatives of the WWII-era B-29 bomber. In fact, all of these aircraft shared many parts, along with a later B-29 variant, the B-50. The fuselage design of the "Strato"-cousins resembles two cylinders with one stacked atop the other lengthwise. Mansdorf and Conroy envisioned replacing the upper cylinder with a much larger tube that could contain rocket parts and other plus-sized cargo. Despite any real interest from NASA, the pair forged ahead using capital from private investors. They established Aero Spacelines as a company to manufacture and operate their planned fleet of overstretched planes. 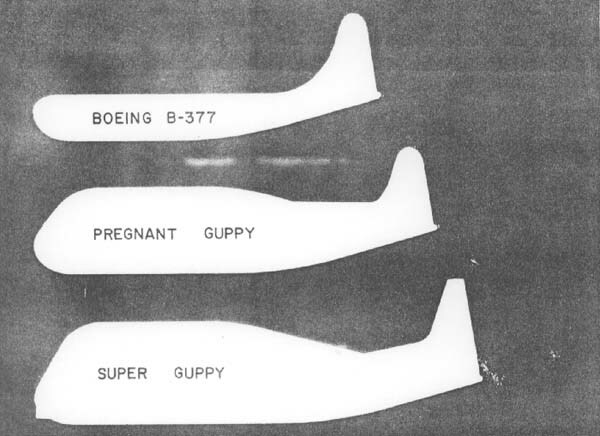 Their first example, the "Pregnant Guppy", was built using parts from two 377s. It emerged in 1962 measuring over 16 feet longer than its parts donors. More importantly, the upper section of the fuselage had grown to a diameter of 19 feet. This transformation gave the airplane its ungainly appearance, yet made it the only aircraft capable of carrying the 40 foot long, 18 foot diameter S-IV stage of the Saturn I rocket. Initially, the oversized section was constructed over the top of the stock upper fuselage. In this form, Conroy took the airplane on a tour of NASA facilities to drum up interest. It was at Marshall Space Flight Center in Huntsville, Alabama that Conroy swayed the NASA insider who would champion his idea – none other than Wernher von Braun, a driving force of the US space program. Once Aero Spacelines had a commitment from NASA, they removed the original upper fuselage to open up the full volume of the enlarged cargo area. The entire tail section could be unbolted and rolled out of the way on a dolly fixture to enable loading of cargo. Despite its massive change in profile, the Pregnant Guppy was only 3000 pounds heaver and 15 mph slower in cruise than a standard Stratocruiser. 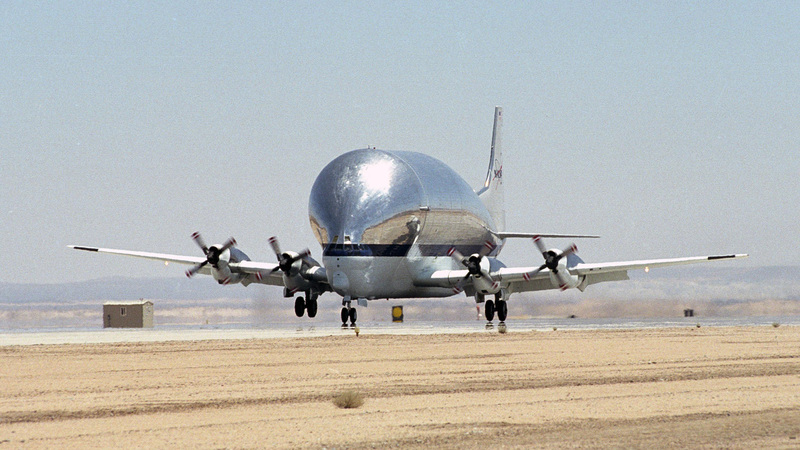 The Pregnant Guppy served Aero Spacelines for 12 years, carrying many vital parts for NASA. It was later sold, and eventually mothballed. Yet, the Pregnant Guppy would again play an important role for NASA. More on that later. Encouraged by the success of the Pregnant Guppy, Aero Spacelines began work on a larger modification of the Stratocruiser. 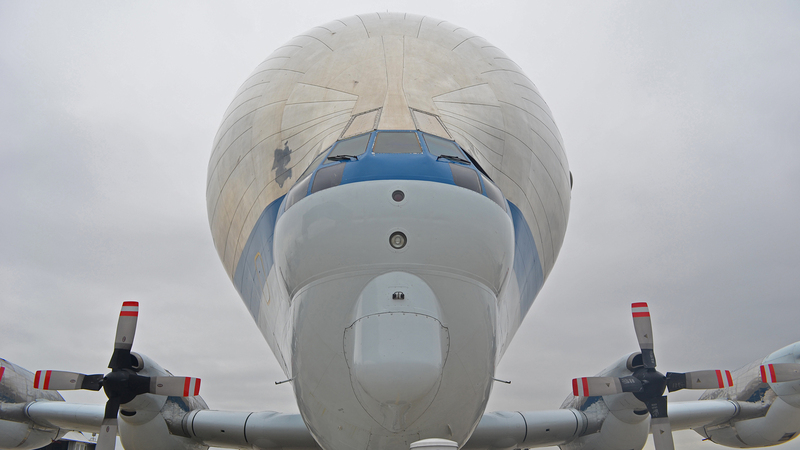 The Super Guppy was rolled out in 1965 with an additional 14 feet in length and a 25 foot diameter cargo area. The complex 3500 horsepower, 28-cylinder radial engines were replaced with simpler and more reliable turboprop engines. Each engine provided more than 1000 pounds in weight savings while also producing an additional 2000 horsepower. This photo of the cargo area was captured from the rear of the aircraft looking forward. It is a huge space. The changes incorporated in the Super Guppy allowed it to haul larger cargo totaling up to 41,000 pounds (an 11,000 pound increase over the Pregnant Guppy). The addition of a pressurized cockpit also permitted the Super Guppy to operate at higher altitudes, where it could fly above adverse weather. Rather than a removable tail, the Super Guppy featured a hinged nose section that could be rotated to provide access to the cargo area. The life of the Super Guppy was very nearly a short one. During dive tests, the forward section of the cargo area caved in and opened a gaping hole. The onrushing air created tremendous drag and caused the airplane to shake violently. The crew was preparing to bail out when they realized that recently-relocated antennae near the escape hatch were likely to slice them as they jumped. They stuck with the airplane and managed to land safely on the lakebed at Edwards Air Force Base. Following repairs, the Super Guppy began flying critical cargo for NASA. The agency would eventually buy the airplane. It is now retired and stands outside at the Pima Air and Space Museum in Arizona. The next Guppy iterations did away with the lower fuselage portions of the Stratocruiser. Aero Spacelines built an entirely new middle fuselage to which they grafted the nose, wings, and tail from a 377. 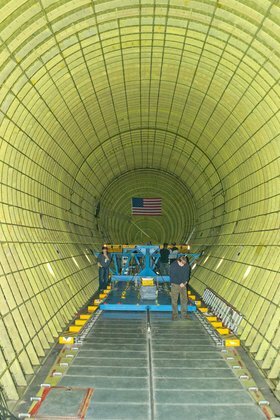 The new design retained the length of the Super Guppy, but the diameter of the cargo hold was reduced to just over 18 feet. Ironically, this newest spawn of the Guppy series was called the "Mini Guppy". 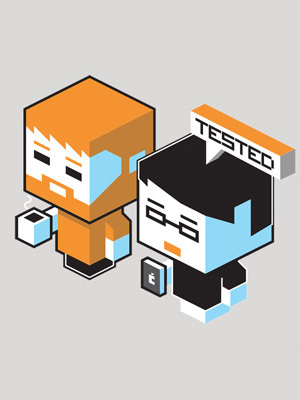 Two examples were built. The first Mini Guppy retained the piston radial engines of the Stratocruiser, while the second airframe featured turboprop engines (Mini Guppy Turbine). Just two months after its first flight, the Mini Guppy Turbine crashed during a test flight, killing all four of the crew. The cause of the crash was never determined. The front view of NASA's Super Guppy clearly shows how much girth was added to the Stratocruiser to make it a Guppy. 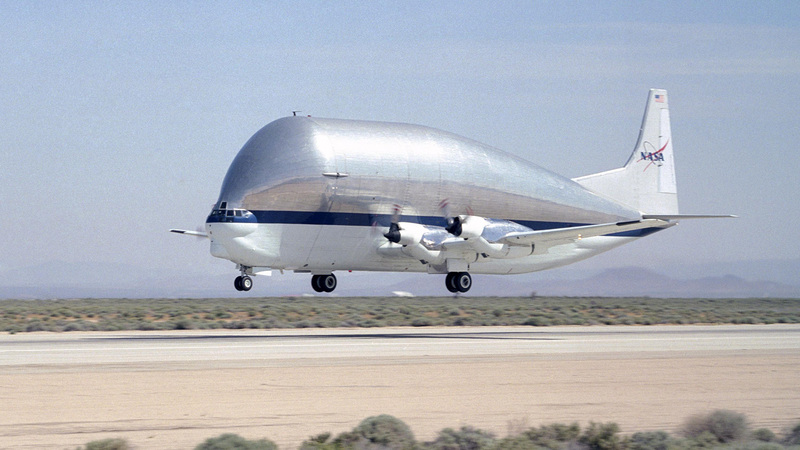 NASA's current model is the final version of the Guppy, the Super Guppy Turbine (although they just call it the "Super Guppy"). It borrows parts from numerous airplanes. It features a custom center fuselage like the Mini Guppy variants, but it is sized at 25 feet in diameter to match that of the Super Guppy. The Super Guppy Turbine retains the nose, tail and wings of the Stratocruiser, but the nosewheel assembly was taken from a Boeing 707 jet. The turboprop engines and their cowlings came directly from Lockheed's P-3 Orion, a 4-engined anti-submarine aircraft. The propellers were sourced from Lockheed's C-130 Hercules cargo plane. Aero Spacelines built two Super Guppy Turbines which were both were purchased in the 1970s by Airbus, Europe's multinational manufacturer of large jets. By 1980, parts for two more Super Guppy Turbines had been delivered to Airbus, which assembled them in France. All four of the Super Guppy Turbines schlepped airplane parts to manufacturing facilities across Europe until the mid-1990s, when Airbus began using their own bloated cargo hauler, the Beluga. At the same time that Airbus was mothballing their Super Guppy Turbines, NASA recognized the need for a cargo plane to support movement of parts for the International Space Station (ISS) Program. A deal was struck in 1997 to bring the youngest of the Super Guppy Turbine fleet to the US. It carried many loads for NASA that would have otherwise been relegated to ground transport. 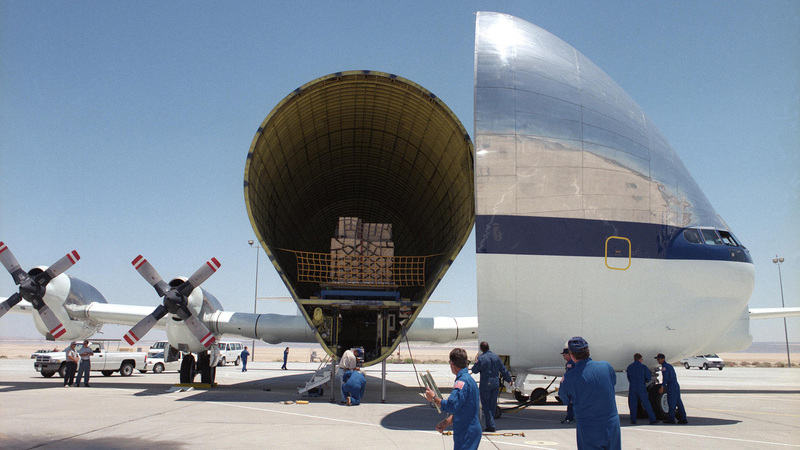 Even though the ISS is now "complete", NASA still uses the Super Guppy to haul large cargo. Even though the ISS is now "complete", NASA still uses the Super Guppy to haul large cargo. It can also be leased to carry commercial loads. The airplane was based at Ellington Field in Houston for several years, but it now hangs its comically oversized hat in the arid climate of El Paso, Texas. 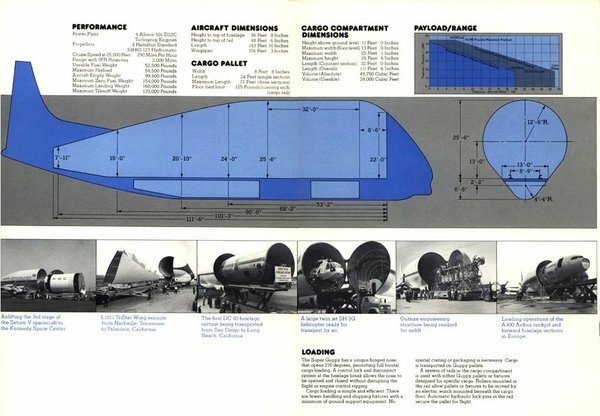 It is interesting to note that when Airbus set about assembling the Aero Spacelines-provided parts for the final Super Guppy Turbine, most of the Boeing-derived components were sourced from a 1953-vintage KC-97. Yet, they had difficulty locating a vital section of the rear fuselage. The supply of surplus Stratocruisers, Stratofreighters, and Stratotankers had dried up completely. By necessity, the very first Aero Spacelines bird, the Pregnant Guppy, sacrificed the essential part from its airframe (originally built in 1948 as the third Stratocruiser) so that the final Guppy could be born. In an era dominated by glass cockpits and fly-by-wire controls, the Super Guppy is a veritable dinosaur. 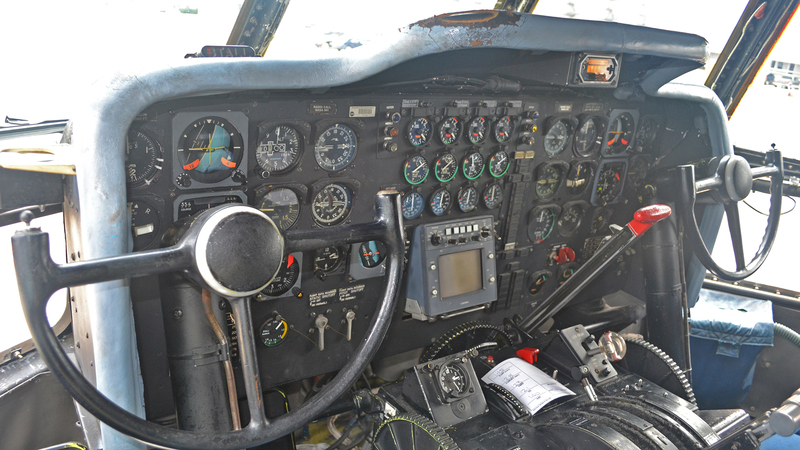 Flying the airplane requires pilots with old-school "stick and rudder" sensibilities and plenty of muscle. One of those pilots is retired naval aviator, Michael Foreman, who has been flying the Super Guppy since 2011. Foreman has more than 7,000 hours of stick time in a multitude of aircraft (not to mention two space shuttle flights that included five spacewalks). He says that of all the airplanes he has flown, it was the P-3 Orion submarine hunter that best prepared him for the challenges of flying the bulging cargo plane: "That experience is why NASA asked me to fly the Super Guppy." 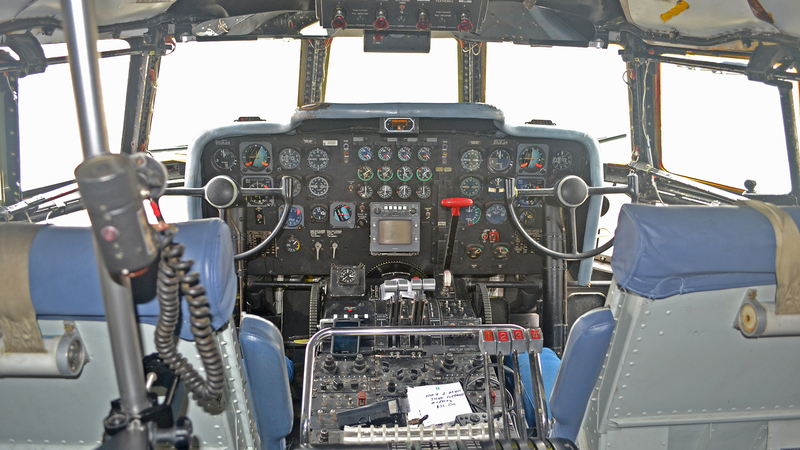 The cockpit of NASA's Super Guppy is decidedly un-modern. The core components of this airplane were originally built in 1953. "We typically fly with a crew of 6 or 7: 2 pilots, 2 flight engineers, a loadmaster and 1 or 2 maintenance guys. "It flies like a big airplane but has a very basic flight control system with no hydraulic boost (or power steering) so you have to kind of muscle it around." It flies like a big airplane but has a very basic flight control system with no hydraulic boost (or power steering) so you have to kind of muscle it around. It definitely lumbers a bit when carrying heavy loads. It's also unique in that we always have the flight engineer set our power for us, even during landings, which takes a little getting used to. This is because it would be almost impossible to both horse the heavy flight controls around AND manipulate the power levers at the same time." "As a flight engineer I preflight the aircraft, run the checklists, start the engines, set power from takeoff to landing, monitor and operate the aircraft systems, and handle emergencies. The Guppy relies heavily on the flight engineer as the pilots are not in a position to see and access all of the aircraft systems controls." "The most unique thing about the aircraft is the nose opening. The flight engineer uses a checklist to ensure all of the cables and locks are removed in the proper order before we open the nose but it is definitely an art when you close it. You have to get the locking pins to align after you have added or removed weight and the aircraft has settled. It can be...interesting." "My favorite thing about the Guppy is that it is unique. There were a few others in the past but this is the last operating Guppy in the world. Everywhere we go there is a crowd waiting for us and I love to talk about the aircraft, its incredible history, and our mission." 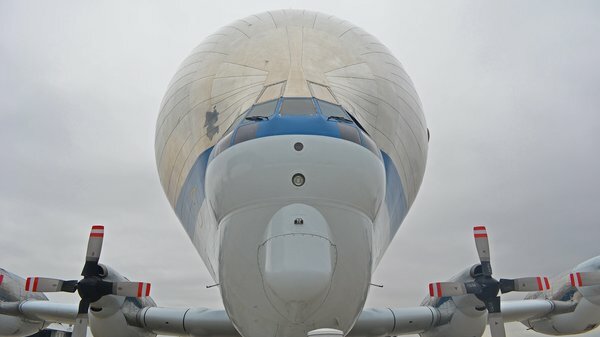 Foreman reports that NASA currently has no plans to retire or replace the Super Guppy anytime soon. 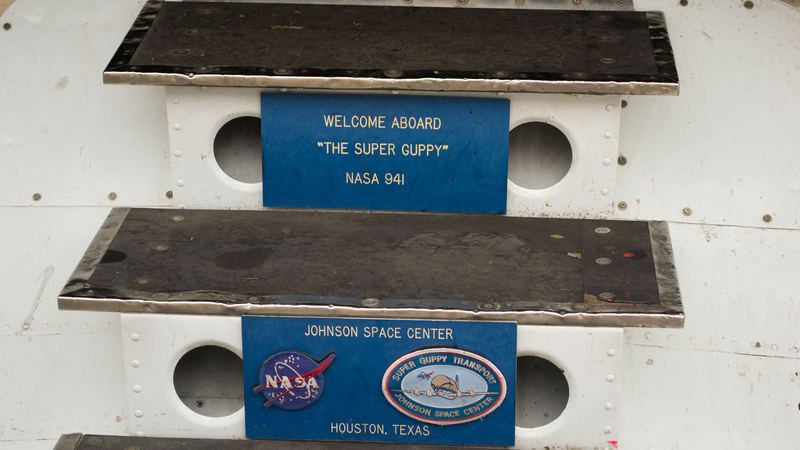 Indeed, the Guppy family has been one of the few constants throughout the history of the US space program. It looks as if the Super Guppy will still be there to provide heavy-lift support when NASA's next generation of manned spacecraft begins flying. Acknowledgements: Most of the technical and historical data from this article was gleaned from All About Guppys, a website with tons of information about all of the Guppy variants. What you see here only scratches the surface. The website owner, Daren Savage, has also built RC models of NASA's Super Guppy and Airbus Beluga. Check it out. Many thanks to Mike Foreman and David Elliot for sharing their experiences with NASA's Super Guppy.